As we're getting ready to switch the site over from playing Duke Nukem 3D (which was our March game) to Starflight (which we'll play in April), we've got something special for you: an extra DOS Game Club podcast, celebrating our 1 year anniversary! We invited all of the regulars that were on the show during the past year. All in all it was pretty crowded, with no less than 7 people total on the show! Besides hosts Martijn & Florian, the following people were present: Marwane, Mike, David, Philipp & Raphael. Now during the show, we decided to rank all the games that we've played in the past year. 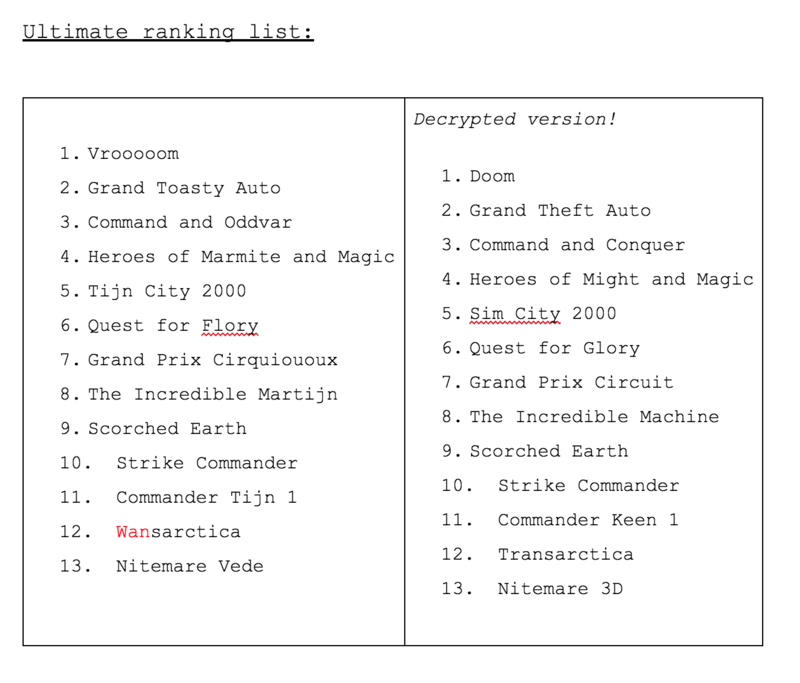 This got pretty crazy, as we were all editing the same document at the same time and people started to replace the real names with joke names, as if ranking all these games wasn't confusing enough to begin with 😀 If you're interested in a screenshot of the final list, you can find it here. At the end of the episode, we played a fun quiz Philipp which had prepared. He also runs the DOS Quiz Twitter account, so if you want more DOS trivia, you can follow him there. In March, we've played Duke Nukem 3D. A podcast discussing that particular game will follow shortly, but if you have something to contribute, please don't hesitate and share your thoughts on our forums. If you'd like to join us, please feel free to register an account, play the games with us and discuss them on the forums. The forum is also used for suggesting games to us. Most of the games we play are chosen from the suggestions. You can also talk to us on IRC. We've got a fairly active channel on AfterNet, called #dosgameclub. Now if IRC isn't really your thing, there is a web client on our site which you can use to join our IRC channel straight from your browser. And last but not least, we're also on Twitter. If you're on Twitter as well, follow us to get updates on what's going on. Doom as your favorite game eh?!?! While I agree it’s certainly the most famous, I would have ranked Hero’s Quest my personal number 1!